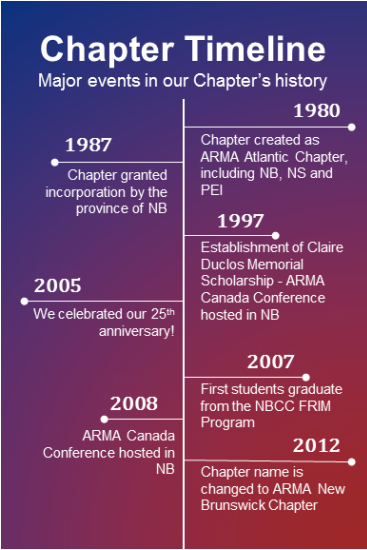 ARMA International has been in existence since 1955, but it wasn't until 1980 that our local Chapter was formed. Before that, members who were interested in ARMA events had to travel to Montreal (the closest Chapter) to participate. Creating our own Chapter meant that people living and working in New Brunswick would have local resources that were more convenient to access and geared toward their needs. What makes our Chapter special? The Claire Duclos Memorial Scholarship Fund was established in 1997 with a legacy from Claire Duclos' estate and is administered by the Chapter. We are proud to have awarded scholarships from this fund each year since 2000 to promote continuing education in the RIM profession. Winners are announced each year during our Annual General Meeting. The Fundamentals of Records and Information Management workshop series was created in partnership with the New Brunswick Community College. Linda MacAdams initially contacted the College about offering continuing education related to RIM after our Education Committee reviewed educational programs across Canada and identified a need. Thanks to Linda's tireless efforts and the College's cooperation there is now a 6-course certificate program offered online through the NBCC.